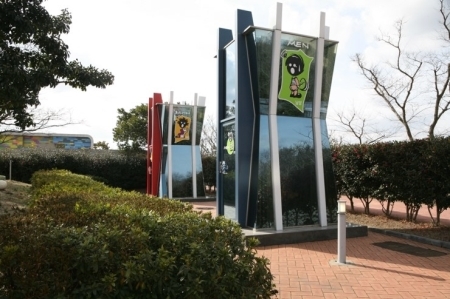 There are two glass themed attractions on Jeju Island. 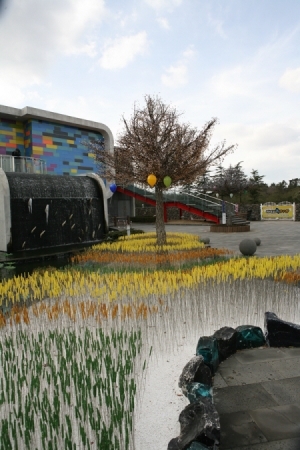 One is the Glass Castle which opened in Oct. 2008 and is located in Hangyeong-myeon, Jeoji-ri. 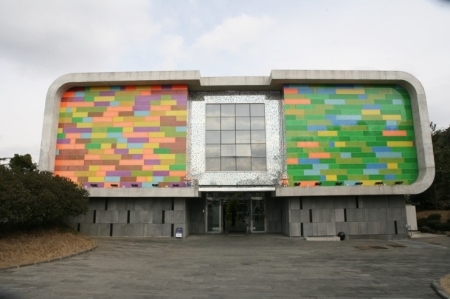 The Glass Museum opened later in 2011 and can be found in Seogwipo’s Sangye-dong. In today’s post I headed to the Glass Castle. 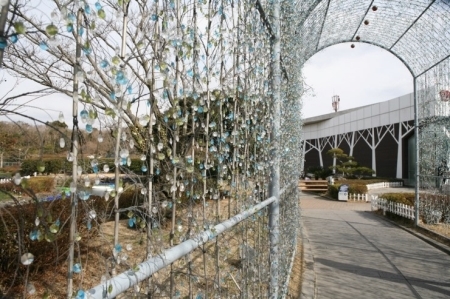 Going in through the main entrance numerous glass sculptures greet you straight away including one which draws parallels from the old tale of Jack and the Beanstalk. It stretches up to the second floor so you’ll need to take a photograph from the vertical direction. As the museum name suggests, everything here is made of glass. Even down to the door knobs. The second floor is also home to a collection of work shops where it is possible to make your own glass bottle. If the times match you can catch a glass artist in the middle of their work as well. 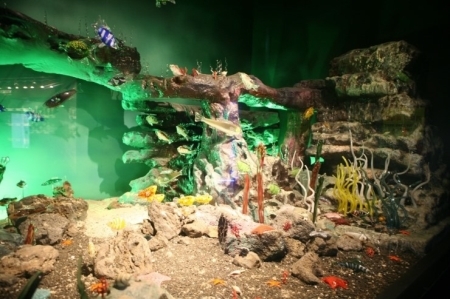 Moving through the main hall brings you to the outdoor exhibitions which includes a pond full of trout. They swim in the water next to a glass toad which seems to collect coins from those who pass by. When people threw their coins at the toad I’m sure they made a wish. There is a mirror maze next which leads to an arch-shaped jewelry tunnel. If it is windy little bells on the tunnel make a lovely sound. 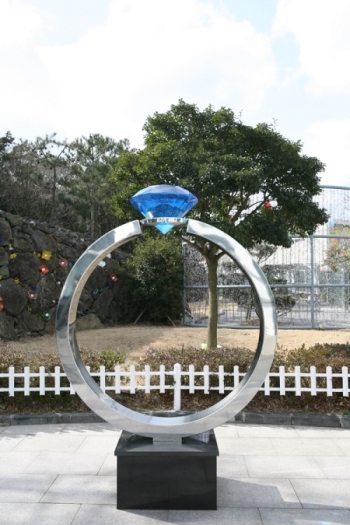 Here is a huge diamond ring. Well, a diamond made of glass. Actually I don’t like diamonds ever since I saw the movie, Blood Diamond. Next it was on to the modern glass exhibition hall. 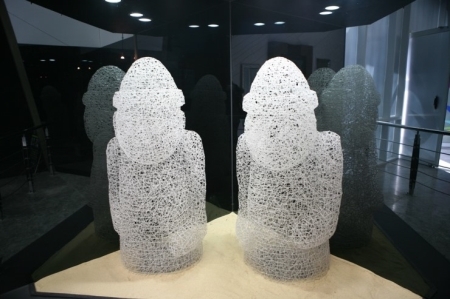 So many types of glass artwork are on display. 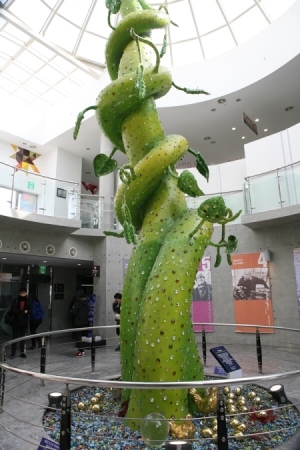 This is one of Jeju’s signature images, the Dolharubang, in glass form. 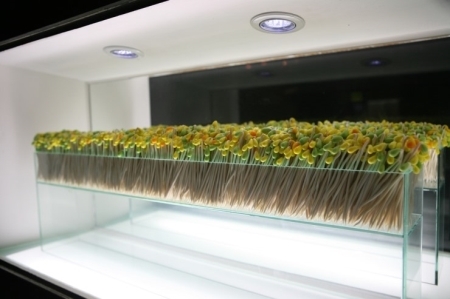 We see a collection of glass bean sprouts and an orchestra. 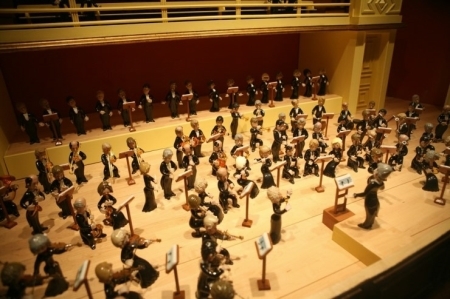 I found it hard to believe the amount of detail that went into producing the small dolls. To be honest it looks like they are made of clay. I’d love to see the process behind the creations. 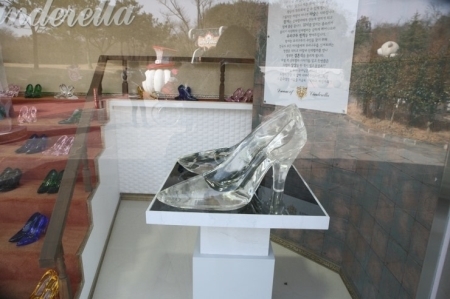 After passing the Jeju stone walls it was time to see the glass shoes exhibit. There are many different kinds, but people were actually lining up to take photographs of the glass pumpkin carriage situated opposite. That’s because if the light is bright you can’t see into the shoe display cases well. Keep on the tour route to see pyramids, instruments, and another pumpkin-related field of glass. It is again amazing to think what these pretty things are made of. What about the toilets though? If you go inside to do your business it is still possible to see everyone outside. However, people can’t see you inside. There is a bit of a strange feeling indeed. The views from the observation deck are good and the back ground color of glass against the oreum gives the whole experience a mysterious feeling. 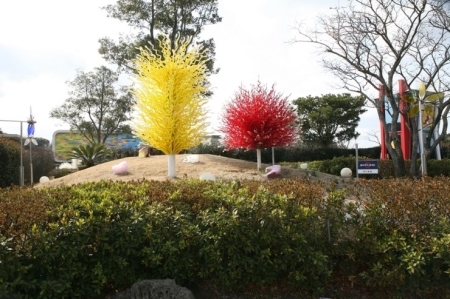 This is Jeju Glass Castle.